There is a rare breed of animal in the world, outside any established morality, divorced from mundane reality, mythically above many of its technically superior kin; that animal is – The Clint Eastwood Movie. Clint Eastwood is an American Hero. And Clint Eastwood Movies deal with the nature of Heroism. SPACE COWBOYS is a Clint Eastwood Movie, therefore to critique its “unrealistic plot” is moot. It stands mythically above plot contrivances, outside any system of common-law judgment; it is hyper-reality and supra-morality. Plot is secondary to Heroism in a Clint Eastwood Movie. The edge-of-plausible story involves four test pilots who, forever glum over being excluded in 1958 from NASA’s fledgling space program, find themselves jubilantly piloting a Space Shuttle into orbit to repair a Soviet satellite – 40 years later! A young Toby Stephens – or the next Man With No Name? 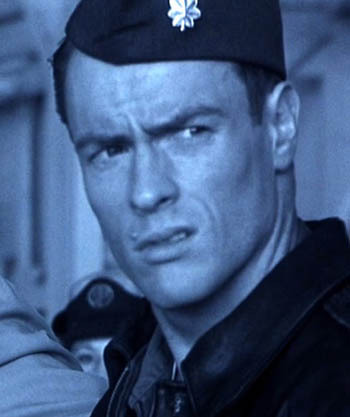 The Casting Director scored big with Toby Stephens (playing the 1958 young Eastwood character), who nails the Clint Squint like a ghost from RAWHIDE; visions of a present-day Man With No Name picture riding across the High Plains of our speculation… hmm. Stranger things have happened – to wit: this movie’s plot. Never losing sight that “entertainment” is a movie’s prime objective, Eastwood’s four stars exude an effortless camaraderie, imbuing the film with a humorous, self-deprecating slant at what a Hero must endure when past his Use-By date. When Frank’s team discover nukes onboard the “communications satellite,” we turn to the token Russkie, Rade Sherbedgia (go-to Russian Character Actor), to provide the furry face of Soviet Collusion at Houston, with an anemic performance that really goes nowhere but vanilla. I guess Cold War apathy extends to film as well. Though the outer space milieu is not Eastwood’s forte, he handles these sequences with such care, dexterity and attention to detail that he escalates the grandeur of being in earth orbit to a scale that rivals the best films ever made in this genre. On the crew’s first spacewalk, there is no desperate clamor to “cut to the chase” – rather, Frank, floating free, first quietly watches the earth turn beneath him. Houston Flight Director, Gene (William Devane, playing his role with extraordinary realism), adds simply, “Welcome to space, Frank.” Jerry joins Frank in gazing Earthward for a few languid beats, as Italy and Western Europe float by in a magnificent Industrial Light & Magic planetscape. Emulating his mentor Don Siegel, Eastwood’s trademark pullbacks have always revealed the grander cityscape backdrop his characters played against; this film lending him the grandest backdrop of all: planet Earth! During Shuttle re-entry into Earth’s atmosphere blanket, Eastwood gives us long shots of the globe, with all the solitude, quiet majesty and obliviousness of this world as that jot of man-made, friction-flaming steel traverses its face. Having somehow wrangled his team of cowboys into space, the accusations throughout the movie against Frank – that he is not a “team player” – attain their irony. He was always a “team player” – but for HIS team. 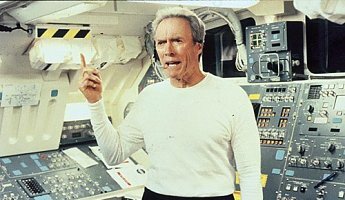 Though the movie retains its class by incorporating latest NASA technology and not explaining its jargon in childish asides, even Eastwood had to bow to the asinine Hollywood tradition of sound in space due to dumbed-down audiences feeling cheated if they don’t hear gargantuan metal constructs creaking and clanking in a vacuum. To accomplish the mission, the acme of Heroism is attained – Hawk’s self-sacrifice. In a grandiose scene that you’d never expect could be from an Eastwood movie, Hawk climbs aboard a jerry-rigged missile-transport, to bronco it to the Moon; he is their Icarus, who never makes it home alive. In a poignant final sequence, Eastwood’s pullback technique is reversed, as Sinatra’s Fly Me To The Moon accompanies a camera zoom to the Moon surface, to an outcrop of rock, behind which Hawk has spent his final living minutes facing Earth. After 40 years dreaming of landing on the moon, however belatedly and tragically, this American Hero finally got his wish. 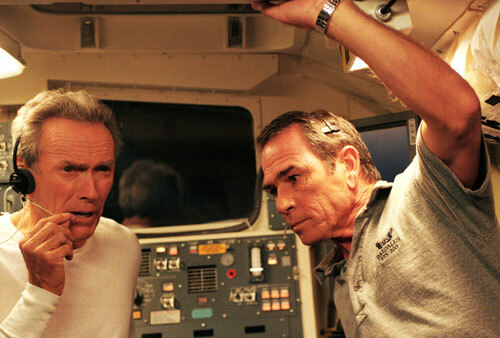 A good-natured dig at critics who accuse Eastwood of being “too old” for an action star, SPACE COWBOYS used John Glenn’s trip back into orbit (in 1998) as impetus to plant this generation’s greatest cowboy back in the saddle, to once more define the Clint Eastwood Movie idiom: that even if they say it can’t be done – a Hero will find a way. Writers: Ken Kaufman, Howard Klausner. Starring: Clint Eastwood, Tommy Lee Jones, Donald Sutherland, James Garner, Marcia Gay Harden, James Cromwell, Rade Sherbedgia, William Devane, Loren Dean.